Dan Sammis is a Florida native, a true “son of a son of a sailor”. His paternal family heritage includes a long line of New England sailing captains, dating back to the mid-1600s on New York’s Long Island. As a young man, Dan became disenchanted with studying land-based Engineering and Architecture at UF and was drawn back to the sea, where he began a 40-year career in marine technologies and yacht operation and sales. Dan’s marine experience includes boat and yacht construction; refit and repair; extensive time in crew positions as a mate, engineer, diver and captain (since 1986) on a variety of commercial, research and charter yachts. Dan also has experience in marine based aviation, submarine systems and technologies and has been well published as a marine and underwater photographer, including on book covers and the pages of National Geographic magazine.Dan has plied the coastal waters of North America on the East coast, from the Florida Keys to Connecticut, and on the West coast from San Diego north to Canada and Juneau, Alaska. He’s also cruised extensively in the Bahamas and along the coasts of France, Thailand and Malaysia. In 1996, after almost twenty years as a yacht and marine professional in Florida and the Bahamas, Dan broadened his horizons by moving to Seattle, where he entered upon his current career in yacht sales and marketing. During a decade in Seattle, Dan worked for several highly regarded marine firms as a Sales Associate and Sales/Office Manager. He specialized in trawler-yachts and high-end ocean-capable luxury cruisers. In 2006, health-related family issues brought Dan back to Florida, where he continued with the sale and marketing of large cruising yachts, including both sailing and power catamarans, which have been of interest to him since his early days as a research yacht skipper in the Bahamas. 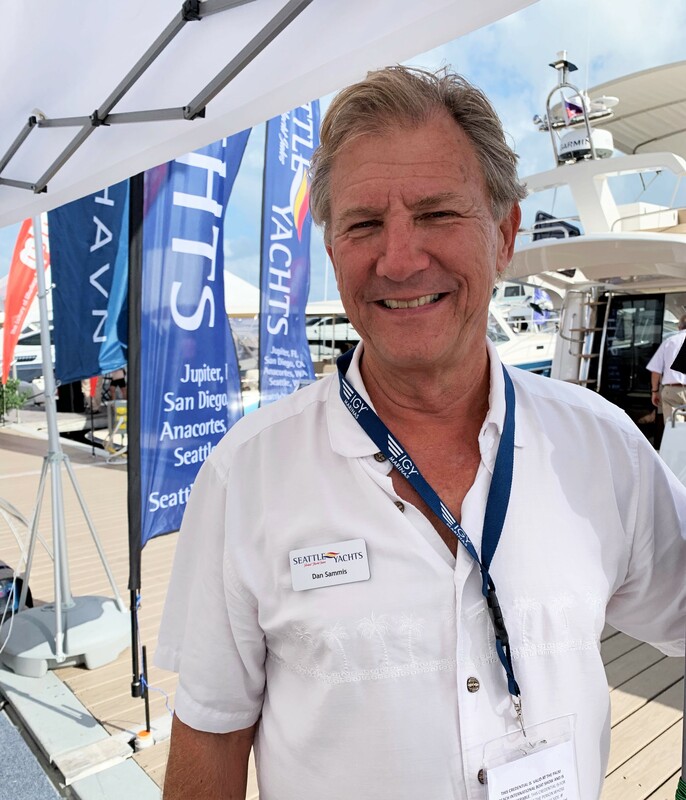 Today, with 40+ years in the marine industries and more than 20 years in yacht sales, Dan Sammis offers his clients the benefit of his extensive knowledge in yachts, their systems and operation. He is expert at yacht market analysis and in inspections for condition and valuation. Moreover, he is an even-tempered, highly effective contract negotiator. Dan looks forward to your call to discuss assisting you in your next yacht project. When beginning our search for a new motor yacht, our captain recommended Dan Sammis as a yacht sales agent that we could trust and count on for great service. Our captain was right. Dan not only helped us to identify yachts that would meet our needs but he also inspected the yachts that we were most interested in providing photos and reports that helped us to evaluate these offerings from across the country. Dan was then instrumental in negotiating a great purchase price and he looked out for our interests during survey inspections, post purchase repairs and delivery. Our schedules prohibited us from making any personal inspections of the yacht before purchase, and Dan’s assistance and oversight gave us the confidence we needed to complete the transaction. We’ve been very pleased with the services offered by Dan and will not hesitate to recommend him to friends and colleagues. OUTSTANDING BOAT BROKER! Boat brokers have a bad reputation. They lie, they are snotty, they are dishonest, or at least that is what we have been told. All lies—at least in our experience with Dan Sammis! We would like to share our experience of purchasing a boat with Dan as our broker. He was informative, and helped us not only research boats, but had insights that helped us narrow down the parameters for our “Dream Boat”. He traveled to France with us to look at new builds. He traveled across Florida to meet us and show us another model. (The other broker advised Dan to “fire us” because we “would never buy a boat, and just waste his time.”) He located a boat at a good price with everything that we wanted, but it was in Singapore. Buying a boat this far from home would have been terrifying, but Dan helped us research the process, traveled with us to Thailand for the survey, and then to Malaysia for the purchase. He helped us locate a suitable marina, and negotiated a fantastic purchase price for us. He arranged the agents for registration, located and flew in a competent surveyor, held our hand when we felt overwhelmed and lost, and helped us celebrate our success. He then proceeded to spend several days cruising in Thailand with us and helped go over every system on Arkouda so that we would understand her. Without Dan, we would have not been able to pursue our dream. Fantastic job, Dan. I would recommend Dan Sammis to everyone! Truly a purveyor of dreams….. I consider myself extremely fortunate that, of all the brokers I contacted in search of the “right boat” for my Retirement 2.0, you were the broker who actually followed-up and followed-through! Although I bought a couple of smaller sail boats wholly on my own back in the day, what boating know-how I learned in buying and owning those boats left me woefully under-educated in the purchase of a twin-engine power boat. Even though you were busy with brokerage duties during the Seattle on-the-water boat show, throughout the entire process, you promptly followed-up on every call and secured every appointment that I needed to view a variety of boats. When the two “finalists” were found, you identified and secured the services of a well-respected surveyor, marine diesel mechanic, and arranged for the sea trials and haul-out. Along the way, you took the time to take every question, offer sound guidance, and most importantly, shared your broad and deep experience in boat construction, model characteristics, marine systems and boat-handling. You offered educational feedback that, thankfully, caused me to reject the first vessel I made and offer on, and that same guidance paved the way for the purchase of our Tollycraft at a negotiated price that I was pleased with. Of equal importance, you didn’t leave me at the altar post-sale, you put me in touch with Captain Rod Irwin to insure that I had access to an licensed and experienced captain to coach me through boat safety, regulatory requirements and boat handling. I’ve had three on-the-water sessions with Capt. Rod, and I now have the confidence to take our Tolly out on my own (granted, under ideal conditions). I look forward to additional training with Capt. Rod on undocking/docking procedures under more adverse conditions, and lock handling, as we absolutely look forward to some Puget Sound salt-water cruises in the new year. I can’t thank you enough Dan. I would recommend you to any prospective boat seller or owner without hesitation. You have exemplary skills and “bedside manner” as a broker, and your friendly and calm demeanor and attention to detail made the process great fun, and I learned much along the way. You are an absolute credit to Denison’s or any brokerage that you choose to work with. I trust and hope that we’ll see you now and again up here in our waters. You will always be a welcome guest at our home, or aboard our boat. I hope we have the opportunity for training or cruising together, and regardless, hope and trust remain friends.